In this digital economy, HR should not be a focus on Human as Resources rather help in rebuilding a human-based experience with more Human capabilities, for the future workforce, and for a sustainable organization. The digital revolution is also having a very significant impact on Workforce and HR Professionals. And the major changes include ongoing demographic, technological, sociological and cultural transformations. In this Digital era, where Technology is changing as the fastest it can. HR professionals should start streamlining and reskilling themselves in terms of collaborating with new technologies like AI and rising innovation. Technologies are radically transforming our professional life, our future work, and role. Along with that, it’s impacting most of the HR functions today. Below Diagram 1 will provide you with the most common HR Functions, areas where it has been impacted by new technologies. HR Functions like Administration and Recruiting are the most affected functions by Technologies today compared to other. But overall it’s going to impact every single area with more automation, augmentation, and amplification. Of course many new areas would emerge; moreover, the impact and adoption are not the same for all these functions. Another important aspect is that we are living in a data-driven world. Analytics is no longer about finding interesting information and identify it for managers. Now, data are being used to understand every part of a business operation, and analytical tools are being embedded into the daily decision-making of business operations. Use of People Analytics is becoming a must-have for any organization (who has data) and more and more organizations are using it for strategic decision making. Most of the daily jobs of HR and many other white-collar professionals are associated with routine tasks; those are repetitive like Paperwork, Scheduling, Timesheets, Personal Expenses, Accounting, Email Management, HR Functions, and Management, Proposal Writing, Hiring, Communicating, Researching etc. All these tasks have the skills which are at risk to get replace by technologies and machines soon or later. Machines are not only better for physical tasks but also good and effectual in skills like administration, analysis, controlling, calibrating, reporting, logging, information gathering, and many others. On the other hand, the most promising skills or human capabilities which can make human in the center of the future work is more valued by creativity, complex problem solving, Emotional Intelligence, relationship making, critical thinking, negotiation, and other cognitive complex behaviors. Diagram 2 shows the top skills which are in risks and also the skills for the future of work. According to McKinsey Global Institute report, executives increasingly see investing in retraining and upskilling existing workers as an urgent business priority that companies, not governments, must lead on. By 2030, as many as 375 million workers — or roughly 14 percent of the global workforce — may need to switch occupational categories as digitization, automation, and advances in artificial intelligence disrupt the world of work. All these going to impact to the workforce and future of work; so the role of HR should also expect more shift towards strategic, advisory and coaching. More awareness is necessary especially with the augmentation form technologies, and that will not only boost the productivity and efficiency but also create an opportunity for a human-based experience. If we want to establish a human-based experience, we should focus on reskilling us and should also consider on the humanization as a benefit. Think about the world where we will humanize again or rehumanize, especially to restore the humanity and moving from a machine to a living system. Humanization is the nonviolent process of reviving the sense of humanity. The natural condition of human beings includes a large capacity for empathy and mutual identification. Humanization calls for a creative mind, enduring patience, and an open mindset. 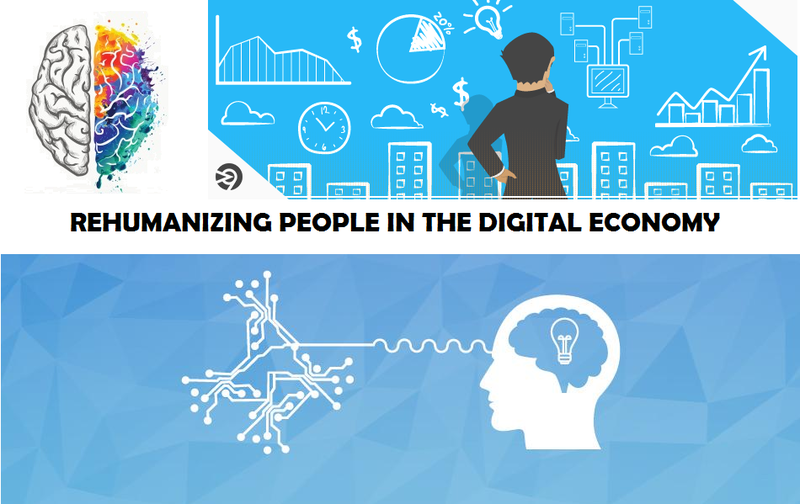 Humanization is also about bringing the following human capabilities into the work which we humans are very good at and it’s indispensable for the Digital Economy. Responsiveness — The act of reacting quick and positive in the perception of both human-human and human-machine interaction. Empathy — To use the experience of understanding the other’s feeling and makes better relationships. Judgement — The ability to decide a course of action when a state is uncertain. Creativity — Forming something new and valuable by using knowledge effectively and readily in execution. These skills are not replaceable easily by machines; moreover, Humanization must be also accompanied and equally balanced by Normalization, which refers to a process that makes the augmentation and amplification by machines more normal or regular in this Digital era. Normalization brings the following human capabilities for better collaboration with machines and technologies. Accountability — Identifying the decisions needed for human intervention and being liable for the cases. Conformity — Generating the moral principles to compliance with standards, rules, or laws to avoid any misuse. Explainability — Providing transparency and interpretability for the immediate outcomes. According to MIT Sloan, all human achievements have been made by groups of people, not lone individuals. As we incorporate smart technologies further into traditionally human processes, an even more powerful form of collaboration is emerging. And these human-based experiences will provide better opportunities for innovation leading by human capabilities and empowered by new technologies. Organizations also need to adapt themselves very well overall, no matter what the initiative is about, they need to empower adaptive self-managed teams with a sense of entrepreneurship to be successful and enable dynamic organizations to emerge and sustain. Whether we agree or not but it is for sure that the future is about collaboration. Not only among people but also between Human and Machine, and there, the human-based experience will lead the frontline to get engaged with machines and creating a sustainable future in the digital economy.